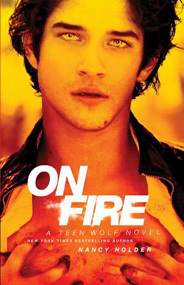 Based on the hit MTV series Teen Wolf—a teenage boy’s life changes forever after he’s bitten by a werewolf. In Beacon Hills, a mountain lion is blamed for a spate of vicious attacks; Scott McCall wishes the cause was that simple. Unfortunately, hiding his werewolf identity, especially from Allison Argent, while fighting his need to shift, is only one problem. Keeping his mysterious, murderous Alpha off his back (literally), avoiding hunters, deciphering strange dreams about flames and impending doom . . . is really eating into lacrosse practice and hang-out time. So when Jackson Whittemore doesn’t show for his date with Lydia, Scott hopes that helping Allison track down their buddy will be simpler. Derek—whose hunger for vengeance blinds him to the dangers that lie in wait—and Stiles are also looking, but the worried teens’ search is leading right to the preserve from Scott’s nightmare. They aren’t the only ones in the woods, and their little trip starts looking less like a rescue mission and more like an elaborate trap—one that will force them to make the choice between killing and being killed. . . .